Yesterday, the CEO of Tesla, Elon Musk, made an exciting announcement on Twitter that orders for their innovative solar roof tiles were opening that afternoon. After the first teaser tweet, Musk went on to provide more information, namely that the roof can be ordered for “almost any country” for a deposit of $1000. US orders will be shipped late this year, with overseas orders following in 2018. Installations are suggested to start as early as June, starting with California. Whilst this might seem like an incredible claim, the roof tiles certainly do appear to be very robustly made. In a demonstration in their test lab, the tiles were subjected to 5cm hailstones travelling at an astonishing 110 mph. The hailstone burst on impact with the solar glass tile, leaving little to no trace nor any damage to the tile itself. In comparison, the traditional roof tiles which were also tested, shattered on impact. Tesla suggests that the tempered glass finish of the solar tiles has up to three times more strength than traditional tiles, which led them to provide their infinity warranty with confidence. This is obviously a huge advantage when considering the usual wear and tear of a standard roof over the course of its lifetime, with tiles normally requiring replacement or repair at regular intervals. Currently, Tesla’s solar roof tiles are available in a textured or smooth glass finish. The textured glass tile is designed to provide a classic and unobtrusive look, whilst the smooth glass gives a modern finish. In 2018, the range will be extended to include Tuscan tiles and French slate tiles. 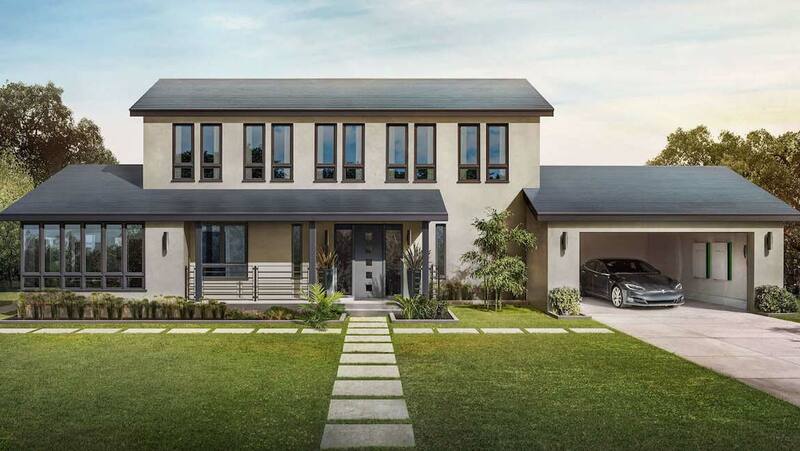 If we compare the cost of Tesla’s tiles to installing a conventional slate roof on a 3,000 square foot home, this would usually come in at around $45,000. Using Tesla’s tiles instead would cost around $65,000. The tiles work in conjunction with a Tesla Powerwall or Powerpack battery to not only power your home, but also to of course recharge your electric car. The tiles have been designed in such a way that you would struggle to tell that they contain solar panels. This is a key feature for Tesla, with the solar tiles being installed in conjunction with nearly identical non-solar tiles. This means that the roof’s appearance is uniform, but the homeowner can fine-tune exactly how much solar output they require from the roof. This new release by Tesla is another step in the right direction towards building a sustainable future, one solar tile at a time.